Oakley Dental is dedicated to providing excellence in dentistry throughout Manchester and the surrounding areas, such as Prestwich, Whitefield and Bury. Delivering best in class cosmetic dentistry, combined with outstanding patient care, all underpinned by our knowledge and understanding of working alongside nervous dental patients . 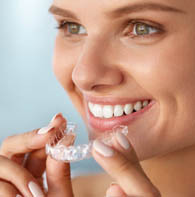 With world class dental and orthodontic specialists, cutting edge technology, such as the award winning Invisalign, invisible braces, and a soothing, calming environment, our Manchester dentist and support team are committed to helping you achieve the smile you’ve always wanted. Principal Dentist and owner, Dr Steve Maskill, founded Oakley Dental over 20 years ago, with the embedded philosophy of providing exceptional patient care, while offering world class, and industry leading dental procedures, which patients have travelled all over the world to have performed. So, if you’re in search of the perfect cosmetic dental treatment in and around Manchester, then the team at Oakley Dental are on hand to make you feel relaxed and create the stunning smile you’ve always wanted!